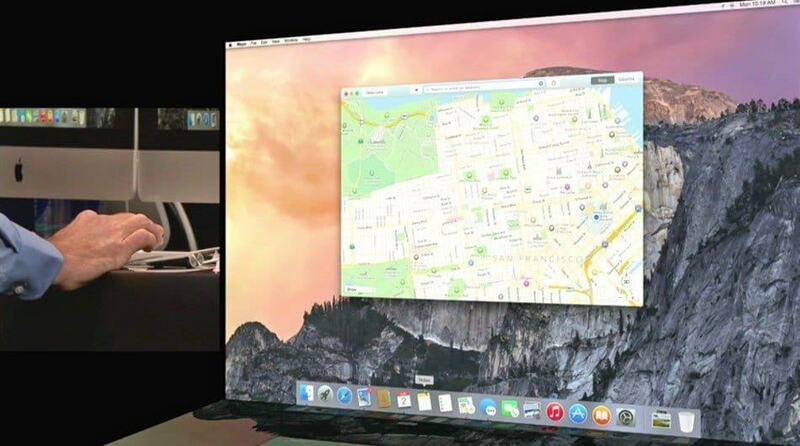 Apple’s Senior Vice president of Software Engineering, Craig Federigh showed his humor on the names of new updated Mac Os X 10.10, by saying different names of California locations as they were suggested by the team, as he said! Well, it drew lot of laughs in the audience! Let’s see the design interface first! 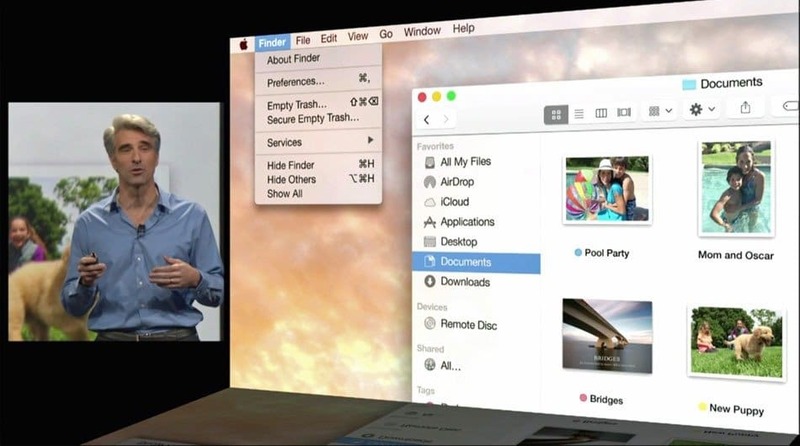 “You would believe how much time we spent on crafting that [now flat] trashcan,” said Federighi. The update also included a redesign of Safari, which offers a slimmer menu bar, giving the user more space to surf the web. There’s also an RSS subscription option embedded in the new browser, making it clear that RSS feeds are alive and well, at least as far as Apple is concernedAirDrop Update, AirDrop also now works between iOS and the Mac. 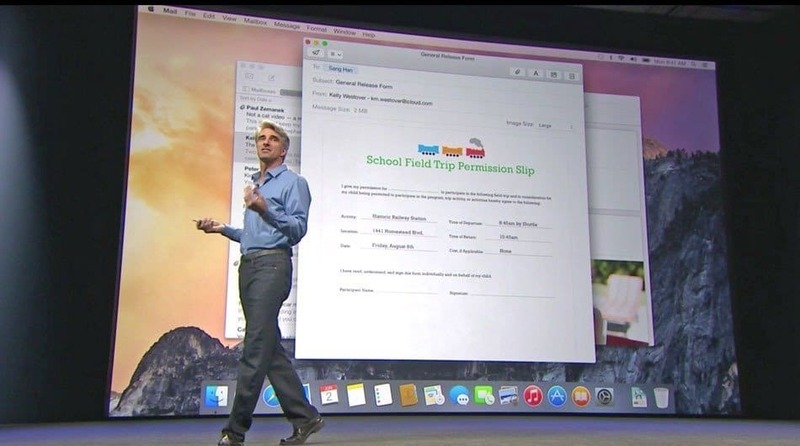 Federighi also introduced a feature that allows you to easily continue to work on the same document or application between your desktop and mobile device, which is definitely gonna be a hit among the people who keep working on their iPhone & iPad and Mac. Documentation and work, made simple. At least, I will say that is a totally new effort by Apple to get into spotlight and make it different from other OS. In Windows devices also, you can edit a document from multiple devices from Onedrive, but not at the same time. You can now also get calls and non-iMessage texts on your Mac as well as make calls directly from your Mac. Federighi demonstrated the feature by calling new Apple hire Dr. Dre. The call, including a waveform graphic, appeared in a translucent box on the Mac desktop. The update will be available to developers today and to the general public in the fall as a free update. There is also a public beta program that will allow anyone to try the new operating system out without being a developer. Meanwhile, Apple cracked the top 5 on the Fortune 500 list for the first time, climbing to No. 5 on the list this year from No. 6 in 2013 and No. 17 in 2012,Fortune ranks the largest companies in the U.S. each year by annual revenues. Apple reported nearly $171 billion in revenues for the 2013 fiscal year, up more than 9% year-over-year. That put it just ahead of Philips 66 and General Motors. Hewlett Packard was the next highest technology company on the list, ranking No. 17 overall. Microsoft, Amazon and Google all ranked in the top 50 on the Fortune 500 list. Walmart was the No. 1 company overall.